The latest numbers have just been reported from TREB for last months (May 2017) real estate marketplace. 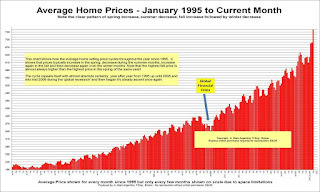 See the graph of average prices by clicking the image below. TORONTO, June 5, 2017 – Toronto Real Estate Board President Larry Cerqua announced that Greater Toronto Area REALTORS® reported 10,196 sales through TREB’s MLS® System in May 2017 – down by 20.3 per cent compared to 12,790 sales reported in May 2016. Sales of detached homes were down by 26.3 per cent. Sales of condominium apartments were down by 6.4 per cent. Selling prices continued to increase strongly in May compared to the same month in 2016. The MLS® HPI Composite Benchmark price was up by 29 per cent year-over-year. The average selling price for all home types combined for the TREB Market Area as a whole was up by 14.9 per cent to $863,910. Year-over-year price increases were greater for condominium apartments compared to low-rise home types. This likely reflects the fact that the low-rise market segments benefitted most from the increase in listings. Thanks for sharing the detailed info.